Toddler Approved! : How Do I Get My Toddler to Clean Up? How Do I Get My Toddler to Clean Up? When is a toddler old enough to start having to help around the house? How do I get my toddler to clean up? These are questions I hear a lot! As a parent it is much easier to clean up once kids go to bed and tell ourselves that "play is the work of children" and that they don't need to help out. Teaching kids to clean up after themselves and participate in family jobs takes time and patience and can be so beneficial to them in the long run though. With my kids I like to work backwards and ask myself, "What do I want my kids to be able to do by the time they are 5?" (or 10?) Once I know those things, then I brainstorm what skills they will need by then and we start working on them now. Starting small can yield amazing results! Toddlers as young as 12 or 18 months can help put a toy in a basket with guidance. The earlier you start involving kids in helping out around the house, the better! Here are 8 things you can do to help encourage your toddler to clean up! Before I start working on teaching my kids to clean, I start by looking around our house and trying to minimize the clutter spots. I de-own and de-clutter the toys areas so that all of the toys have a place to go and any that don't, find a new home! I also go through drawers and closets and give away clothes that are too small or that we don't use so that there is more space. When you don't have as much stuff to clean up it makes cleaning less overwhelming for me and the toddlers! In our playroom we have little drawers with toys in them. One has puzzles, one has little people, and one has magnet dolls. If I just take out one drawer, it makes it much easier to play and clean up, versus if I take out two or three drawers. Next, I try and adjust my expectations. My toddler loves to dump toys and easily can destroy a room in just a few minutes, but the process of putting all of those items right back where they belong takes so much longer! Why is that? 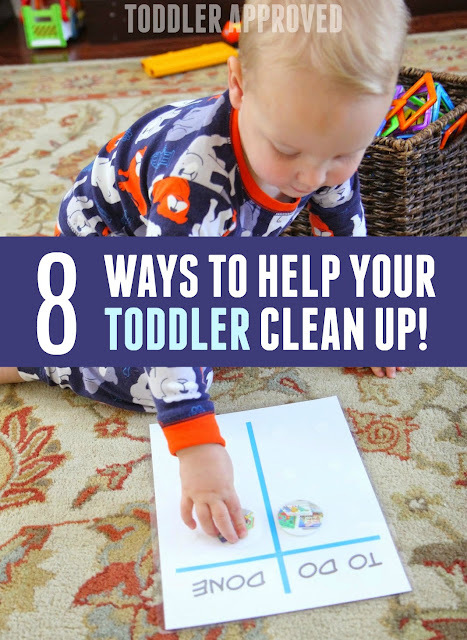 Younger toddlers who are still learning to match and sort and listen to directions, might only be able to put a few things away, while an older three-year-old may get a large messy space picked up quickly. Bringing out only a few toys at a time is a great way to start. When I am present and playing nearby, it is also easy to encourage toddlers to put one toy back before they take out another toy. Sometimes I will keep the majority of toys put away and inaccessible to save my sanity and keep things cleaner. Telling a toddler (or most kids under 5) to clean the playroom or clean their whole room is unrealistic for most kids. Breaking that task down into segments is the best way to be successful (in my opinion). First, encourage them to pick up the books, then the blocks, then the LEGO, then the costumes, etc. You will need to be a coach and helper for awhile until kids know where things go and need less support. Labelling drawers and bins and buckets with pictures of what goes where can be life altering for clean up time! I've done this a lot and it makes clean up time so much easier! Taking a photo of what a cleaned up room should look like can also help kids. Have you tried either of these before? I think I need to do this for my food pantry so I can keep it organized as well! I also label clothes drawers to help my husband know where things go too! Everyone can benefit from a visual system! You can also make a to do/done visual checklist for kids to help them know their jobs! There are so many great clean up songs. I shared my 8 favorite clean up songs here. Our Google Home has completely changed clean up time at our house! My kids love to turn it on and play their favorite songs while cleaning and it is so motivating for them! We only let them take it to their rooms when they are cleaning, so they love cleaning time now! I haven't always been the best example of cleanliness. There are a few years there where I wouldn't make my bed and dishes sat in the sink way too long. Although that happens sometimes, now on busy weeks, the majority of time, I am a good example and am almost always picking up after myself, hanging up clothes, clearing my plate, and putting my belongings away. Kids are always watching. When they recognize that cleaning up is something that your family values and they see that it is something that you think is important and it is a routine that is consisten, they are more likely to be helpful. When I get creative and my kitchen is a disaster and I get totally overwhelmed, I want to crawl into a hole and hide. This is totally how my kids react sometimes when they make a big mess and know that they have to clean it up. I love when my husband chips in and helps me with my giant mess... so I like to pay it forward and go work with my kids to help them pick up their messes too. I don't do everything, but I say things like, "What do you want me to pick up?" or "I can pick up the LEGOs if you can pick up the books?" Stress decreases immediately when I offer to help in this way! I want my kids to have positive experiences around chores and cleaning. I want them to learn to feel a sense of accomplishment when they have cleaned their room or helped make the house look good. I also want them to learn to take good care of their belongings (and mine- like the house) and have pride in what they do. Encouragement goes a long way! With toddlers I let them know how proud I am of them when they pick up and give hugs and high fives. If they do something wrong, I don't criticize, but I'll gently show them the right way and then re-teach skills later on... like how to clear the table properly or which toys go in which bin. The more consistent you are with cleaning up, the less of a fight it becomes. If kids know, if I take it out, I have to put it back, it becomes less of a power struggle for most kids. Having a set time each day to clean up can also help kids get into a good routine. We like to clean up right before dinner during the school year, since after dinner we go straight into reading and getting ready for bed. During the summer we like to do a lot of cleaning up in the morning before we head off for the day. The kids are a lot more motivated to clean when they know something fun is happening afterwards and they can't leave until it is done. Do you have any cleaning routines set at your house? How do you get your toddlers involved with helping at home? What about older kids? I'd love to hear your tips/ideas! Here are three more ways to help kids clean up with less frustration. What other skills do toddlers need to be working on? Here are 6 more skills toddlers need to learn.